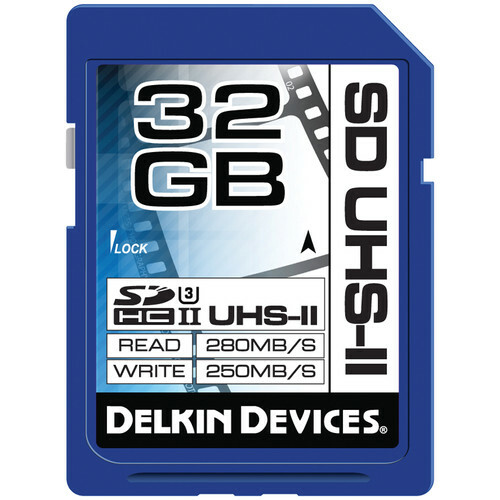 The 32GB UHS-II SDHC Memory Card from Delkin delivers read speeds up to 280MB/s and write speeds up to 250MB/s. 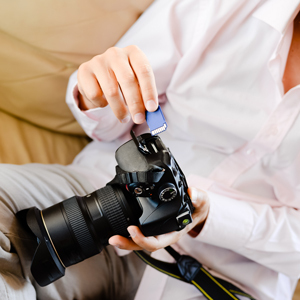 When used with an UHS-II compatible camera, this memory card has an UHS Speed Class 3 rating to allow you to record 4K, 2K, and 3D videos without any interruptions. This memory card also supports RAW burst and high frame rate recording. For non-UHS-II devices, you can still use this memory card since it is backwards compatible, however, it reduces the read and write speeds up to 100MB/s. With 32GB of storage capacity, you won't have to worry about running out space when storing photos, videos, and more when using the Delkin UHS-II SDHC memory card. Box Dimensions (LxWxH) 6.3 x 4.2 x 0.5"
32GB UHS-II SDHC Memory Card (U3) is rated 5.0 out of 5 by 1. Rated 5 out of 5 by Lauren Versailess. from wraite spid, test Wraite 160-180 mb/sec.mi test. Faster then any difarent card. no show 250mb/sek. wraitig. I not shur 100%. Rezume for card 5 star anyway.